The holidays are over and like many folks I did a lot of shopping in the last few months but I didn’t frequent many shopping malls or major retail outlets. I spent most of my time and hard earned dollars in secondhand stores and antique shops. This wasn’t just a budget conscious choice. It was also a personal choice. I love recycling forgotten treasures and giving cast off goods a new home. Visiting an old curiosity shop can be an eye-opening experience. They’re a lot like museums without any cumbersome entrance fees and everything is for sale. As a classic film lover I’m constantly on the look out for any unusual movie memorabilia that catches my eye and during the past year I’ve come across a lot of surprising discoveries at local antique shops. Most of the film-related items I stumbled on were too rich for my blood but that doesn’t lesson the pure enjoyment I get from seeing them firsthand and I thought it would be fun to share a few of the highlights from my window shopping adventures. Hopefully other classic movie enthusiasts will find some of these items as intriguing as I did. Home Video Roundup: Christmas Edition! It’s that festive time of year again, when family ties are maintained through the ritualized exchange of fabrics, wrought plastics and optical discs. This joyous occasion ensures that husband and wife, or parent and child, can contentedly ignore each other until the next wallet-busting holiday. I am here to ensure the smooth operation of this essential human activity, providing an idiosyncratic list of new DVDs and Blu-Rays that, if wrapped in glossy paper, will blind your favored loved one to your significant shortcomings. To prove my goodwill, my wife and fellow writer Andrea Janes will close out the list with her thoughts on a movie I asked her to watch, as a distraction from my lax grooming habits. Seasons Greetings! When people see the name Pierre Cardin they usually associate it with high fashion. The French designer is known worldwide for his cutting edge fashion designs, stylized accessories and various perfumes. But he’s also responsible for creating some incredibly beautiful costumes for classic films and popular television shows. Cardin has dressed many talented starlets including Elizabeth Taylor, Brigitte Bardot, Shirley MacLaine, Joanne Woodward, Jane Fonda, Mia Farrow and his one-time love interest, Jeanne Moreau, just to name a few. Today Pierre Cardin is celebrating his 89th birthday and I thought it would be fun to take a look back at the designer’s impressive career and highlight his contributions to classic film. Today marks the beginning of TCM’s Classic Film Festival taking place April 28-May 1. A number of people have asked me if I’m attending the festival this year but unfortunately I’m stuck at home writing about it. Personal budget constraints make my attendance impossible but there are a lot of film screenings and events taking place at the festival that I wish I could see. I thought it would be fun to imagine how I might have planned out my trip to TCM’s Classic Film Festival this year and share a few movie recommendations in the process. Whether you thought she was a great actress or just a movie star, you have to admit she was THE movie star for a generation of moviegoers. From her debut as a little girl of 10, through her star-making MGM years, then into the years of crazy international stardom and oodles of publicity for her colorful and passionate off-screen life, Elizabeth Taylor held a fascination for the public nearly unequalled even today. It was a different time, of course, when Elizabeth Taylor ruled the headlines, a slightly more genteel time when beautiful movie stars maybe stole husbands from each other, but refrained from publicly exposing themselves quite the way it’s done today. Elizabeth Taylor has always been one of my favorite actresses. She was an incredible natural beauty. Arguably the most beautiful actress Hollywood ever produced but she was also a brilliant performer when she wanted to be. She dominated almost every film she ever appeared in even when that film wasn’t particularly worthy of her larger than life presence. Taylor was a complex woman with a rich inner life who enjoyed living and one look into her deep violet eyes told you this. Inside of Taylor there seemed to be a volcanic mountain of pent-up emotion just waiting to explode. Her appetite for life was voracious but her heart was huge, open and warm. These are rare and wonderful qualities that you seldom find in today’s Hollywood stars. A blur of thousands of words and pictures began to tumble out of every medium as soon as news of Elizabeth Taylor’s death at age 79 was announced on March 23rd. I know that the most noteworthy features of this performer’s life are the many adult roles she played with skill (on screen and off), her remarkable beauty, durable, often deliciously excessive glamour, the ups and downs of her not-so-private life, and ultimately, her pioneering charity work to assist those with AIDS. People will naturally mention her two Oscars. One was awarded for her tart with a heart in the often ludicrously steamy Butterfield 8 (1960)–making up for the Academy’s neglect for her fine work in Cat on a Hot Tin Roof (1958)–and her well-deserved Best Actress Award for the harrowing and truthful characterization in Who’s Afraid of Virginia Woolf? (1966). To me, however, Elizabeth Taylor is cherished in memory for her extraordinary work near the beginning of her career, when she gave herself completely and unselfconsciously to the role of Velvet Brown, a dreamer, whose love of horses seems to border on a pagan devotion deeper than civilized analysis can ever explain away. 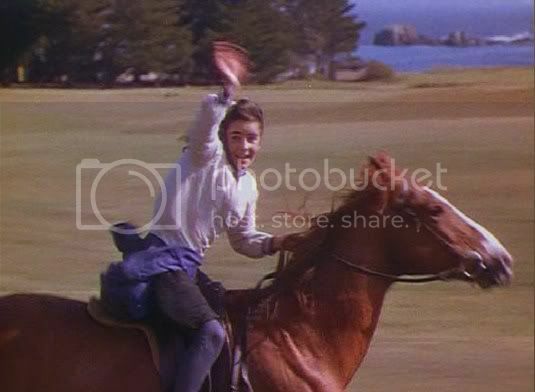 All of the entertaining blather surrounding this “last great star” falls away when watching National Velvet (1944), a beautifully crafted product of the studio era at its height. This role prompted the already accomplished rider (Elizabeth Taylor’s father had taught her to ride at the age of 4) to train rigorously each day and, with the guidance of her ambitious mother Sara, prompted the tiny girl to try to grow three inches to be an acceptable height for producer Pandro S. Berman (lifts in her shoes and some natural growth helped a bit).